Your skin faces a lot of ordeals, fighting against dirt, impurities, and germs that constantly come in contact with your body. Repeated exposure to pollutants can lead to skin problems such as dry, lifeless skin, pimples, and blackheads. Now you can find an all-time solution to skin problems with Jiva Almond Scrub Soap. It is a fine combination of herbs renowned for their efficacy in skin care, such as neem, almond, and aloe vera. Regular use of this soap cleanses the pores of accumulated impurities, keeps the skin infection-free and restores life to dull skin. Jiva Almond Scrub Soap has Neem, Almond, Aloe Vera, Masoor, Gehoon, lemon, Marigold. 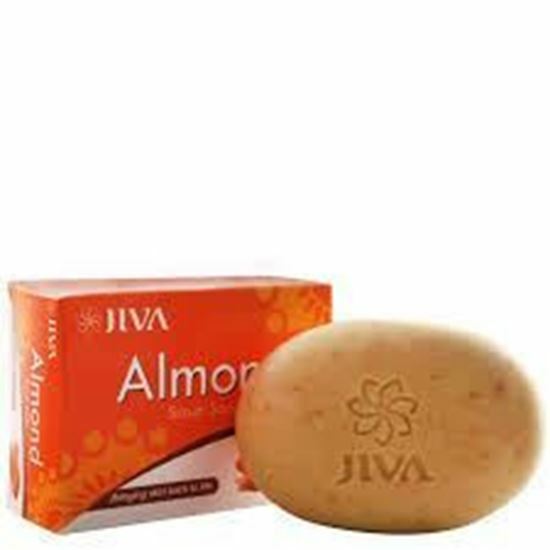 Jiva Almond Scrub Soap regular use on face and body, as a bath soap. Jiva Almond Scrub Soap is recommended dull, pale, lifeless skin, blackheads, blemishes. Herbs like Aloe Vera and Neem, both deep pore cleansers, refresh your skin. Almond and Masoor restore its youth. Gehoon prevents premature aging. It adds glow and makes your skin healthy and beautiful.